Front Row (left to right): Timothy Sandoval (Chicago Theological Seminary), Dirk Lange (Lutheran Theological Seminary at Philadelphia), Christopher Lutz (St. Meinrad School of Theology), Janet Schaller (Memphis Theological Seminary). 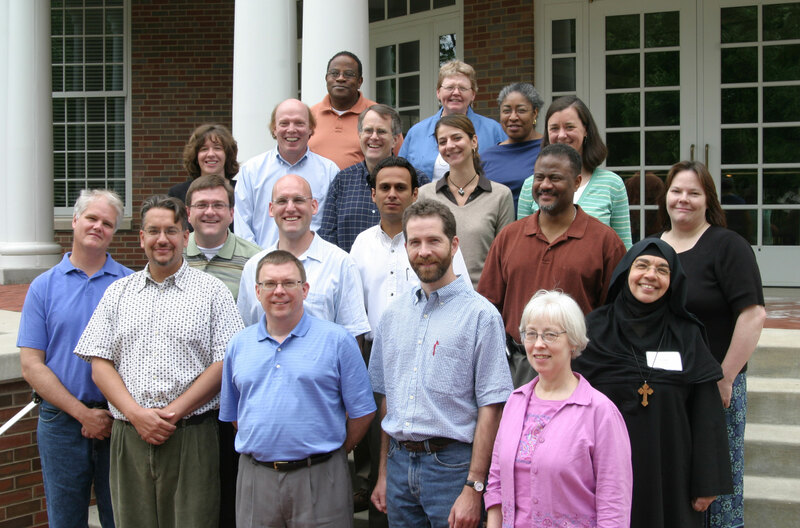 Second Row: *Thomas Pearson (Wabash Center), Scott Seay (Christian Theological Seminary), Chris Brittain (Atlantic School of Theology), Octavio Esqueda (Southwestern Baptist Theological Seminary), Rodney Sadler (Union – PSCE), Lois Farag (Luther Seminary), Deirdre Hainsworth (Pittsburgh Theological Seminary). Third Row: Angela Senander (Washington Theological Union, DC), Paul Galbreath (Union – PSCE), *William Brown (Columbia Theological Seminary), Francesca Nuzzolese (Palmer Theological Seminary), Diane Lipsett (Wake Forest University Divinity School). Fourth Row: *Stephen Ray (Lutheran Theological Seminary at Philadelphia), *Joretta Marshall (Eden Theological Seminary), *Evelyn Parker (Perkins School of Theology).